And the 2018 Miracle Maker Award Goes To…. 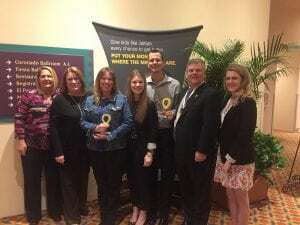 Justin Brown, broker/owner of RE/MAX Elite, and Heather Holliday, technology and marketing consultant of RE/MAX Elite, were recognized as Miracle Makers by the CMN Hospitals Board of Governors during Children’s Hospitals Week in Orlando. The surprise presentation took place at the Board of Governor’s meeting last Monday. Across the country there are committed individuals who change the world for kids through their dedication to Children’s Miracle Network Hospitals. Beginning last year, the Board of Governors recognizes a local Miracle Maker at each of Board of Governors meeting. This is their chance to honor those who make it possible for CMN Hospitals to save and improve the lives of as many children as possible. Justin and Heather embody the spirit of this award. When meeting with buyers and sellers, RE/MAX Elite agents are able to meet in a CMN Hospitals-dedicated meeting room filled with artwork and posters celebrating their partnership. Not only do they encourage support for CMN Hospitals through their office and agents, but they regularly volunteer for their local Radiothon and visit their nearest Dairy Queen for Miracle Treat Day. Both are dedicated to CMN Hospitals’ mission and work continuously behind the scenes to ultimately grow the level of awareness on a localized level. Congratulations, Justin and Heather! Thank you for all that you do! Comments for And the 2018 Miracle Maker Award Goes To….